This review is the second in a series of long-haul reviews for my AUS—JNB—IAH mileage run. 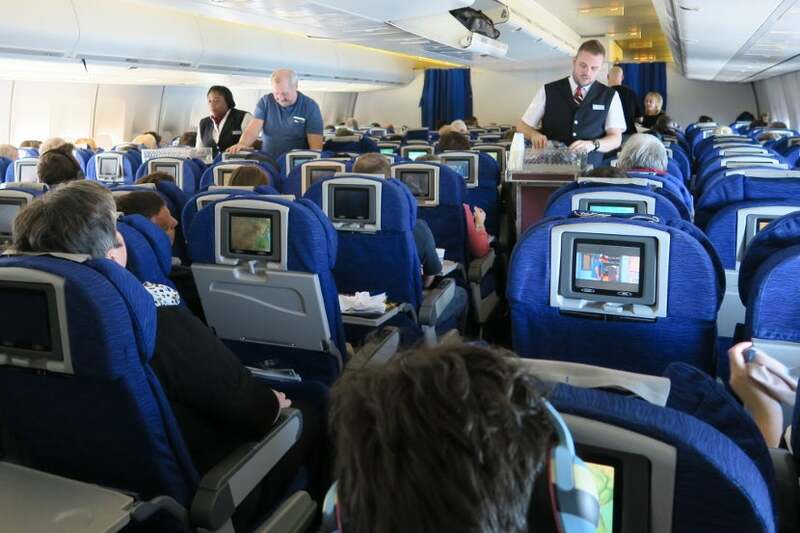 As such, more of my booking details — like how I got British Airways to change my departure city for free — are available in my first long-haul review of American’s 777-300ER Los Angeles (LAX) to London (LHR) in Main Cabin Extra. For $804, I was able to stretch the mileage of my run to 23,510 miles, which yielded a cost of 3.42 cents per mile. I earned 23,820 elite-qualifying miles and 49,640 redeemable miles (including 2,000 bonus miles from flying a transatlantic round-trip). The redeemable miles are valued at $745 under TPG’s current valuation of 1.5 cents per AAdvantage mile. I booked my mileage run using my British Airways Visa Signature Card, so I earned three British Airways Avios per dollar spent, a total of 2,412 Avios on this trip, which TPG values at $36 (since April’s valuation shows Avios are worth 1.5 cents each). 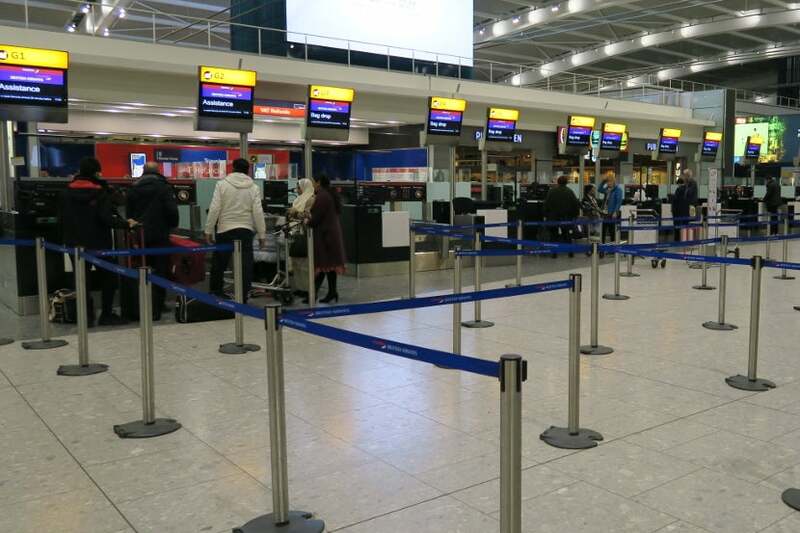 There were ample check-in counters available at LHR. I arrived at LHR Terminal 5 via the London Underground Piccadilly line about four hours before departure. Although I could’ve used my Oneworld Sapphire status to use priority check-in, there was no line at the the standard check-in area. I quickly obtained my boarding pass and was surprised to also receive the boarding pass for my return JNB–LHR leg — even though it was scheduled to depart more than 24 hours from this point. The agent seemed surprised when I stated I had checked a bag, as no bag was appearing in the British Airways system. She said this wasn’t cause to worry though, as apparently bags don’t always transfer seamlessly between the American Airlines system and the British Airways system. I was able to get to the lounge in no time thanks to Fast Track security. 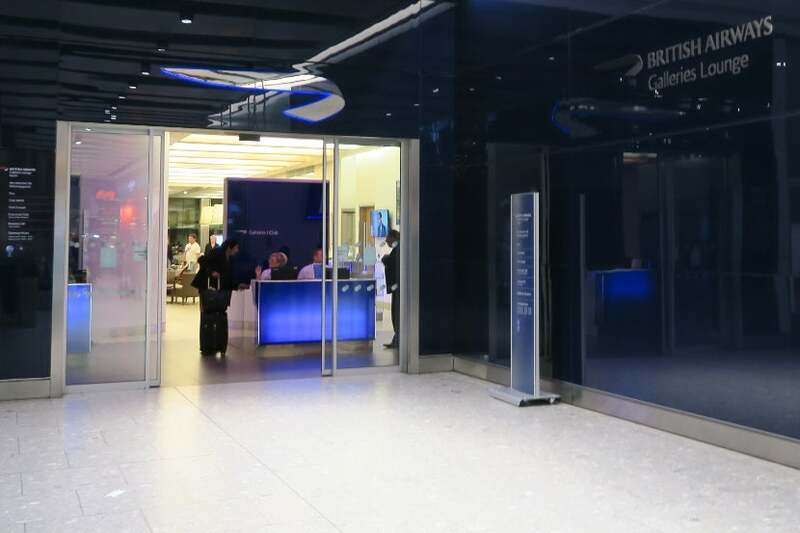 After checking in, I used Fast Track security (available to Oneworld Sapphire and above), which allowed me to clear security and walk to the North British Airways Galleries Club lounge in just ten minutes. The North British Airways Galleries lounge was rather busy when I arrived, so the check-in agent encouraged me to go to the less-crowded South lounge instead. However, when I inquired about a shower, she suggested that I had indeed come to the best lounge as the showers in the South lounge tend to fill up quickly. I had to wait at the shower reception desk for a while before anyone greeted me. 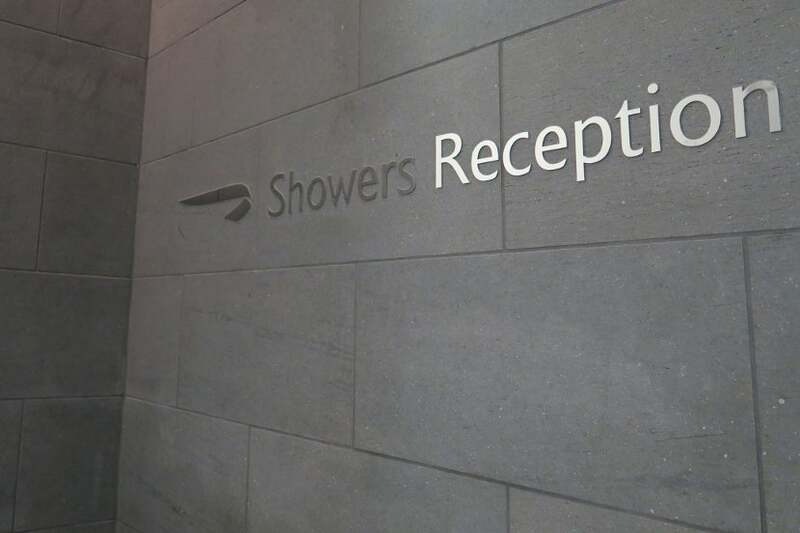 I went straight to the shower reception desk, which remained unmanned for about five minutes. Finally, an attendant came to greet me, apologizing profusely for my wait and immediately assigning me a shower room. The shower room was simple, but had a three-type shower head (ceiling, body jets and handheld), fluffy towels and soaps. The room was very clean but I wish that (1) the only two hooks in the room weren’t directly above the towel rack and (2) conditioner was provided. After showering, I sat in the entertainment area and worked on my laptop. It was somewhat disappointing to see that the power outlets that had been non-functional on my last visit to this lounge almost a month ago were still nonfunctional. Despite this, there were many outlets in the entertainment area that were working and I appreciated that this area had US outlets as well as UK outlets. 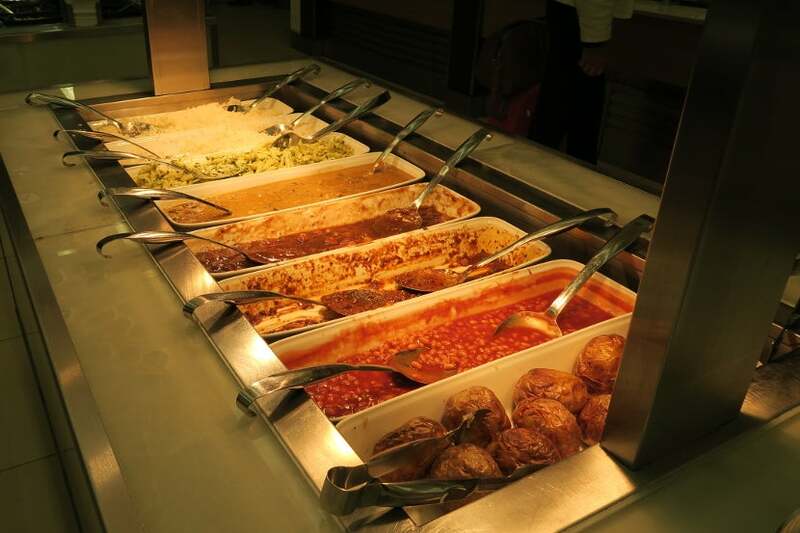 The hot buffet was a bit picked over, but still had many options to choose from. Before leaving the lounge, I visited the buffet and made a plate with field greens and “vegetarian pasta.” The field greens were crisp and tasty, while the pasta was a bit bland but still certainly worth eating. 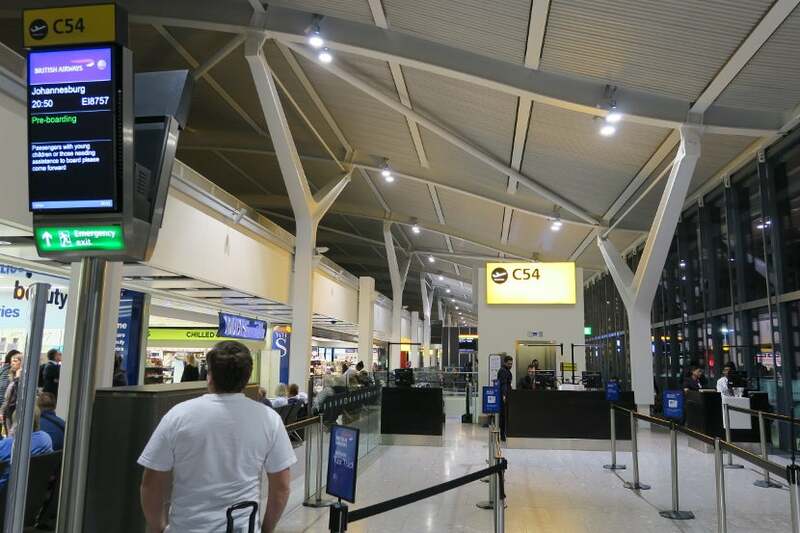 There were four boarding queues — one Fast Track and three general — at LHR gate C54. The flight’s gate was announced about an hour before departure. I took the airport train to the C gates, which seemed to be empty besides our flight to JNB. I boarded the plane during the ‘Fast Track’ boarding phase (available to Oneworld Sapphire, Emerald and Ruby members — as well as First and Business class customers) and was one of the first people to reach the back of the plane, where my 51J seat was located. Seating in the World Traveller cabin, which is mostly a 3-4-3 configuration. 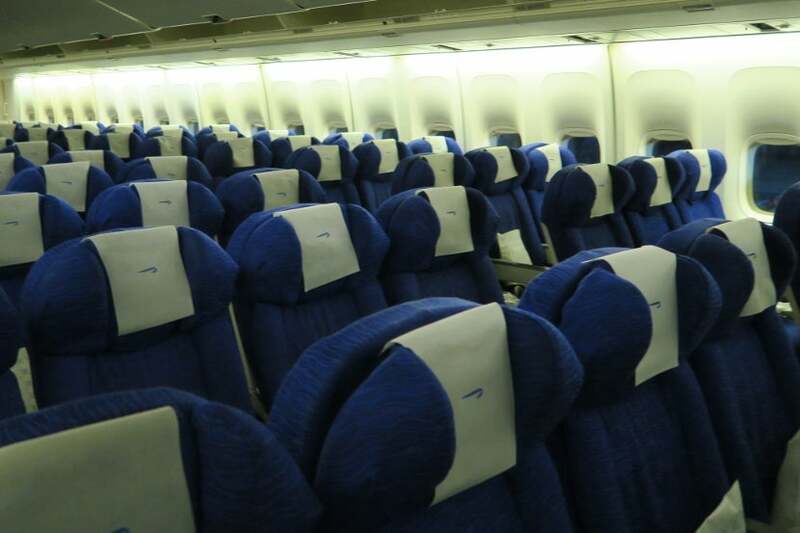 Most of the World Traveller cabin is configured in a 3-4-3 formation. I had purposefully booked one of the last three rows in economy because this part of the cabin is a 2-4-2 configuration. Hence, unlike the majority of the World Traveller cabin, my 51J seat was a window instead of a middle. Row 51 is the first of three 2-4-2 rows and, thus, featured extra space between the seat and window. I booked seat 51J in the first of these rows since it has the most floor space between the window and seat that can be used for storage during the flight. Additionally, you get an extra seat pocket for use as well. 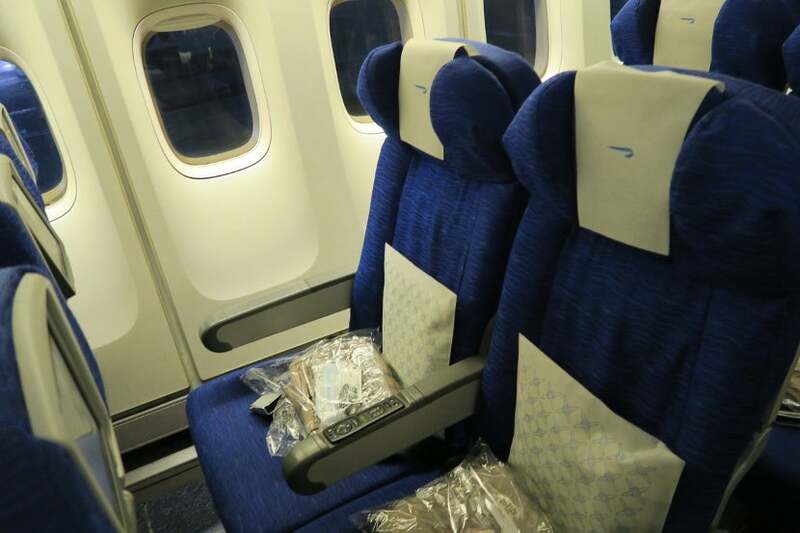 A pillow and plastic bag containing a blanket, toothbrush and toothpaste greeted passengers at each seat. Seats J and H in row 51 (the first 2-seat row) are offset from the seats in row 50. Seat 51J was poorly aligned with the seat (and hence tray table) in front of me. This was only slightly frustrating while eating, but when I wanted to use my laptop on the tray, the angle made it somewhat uncomfortable. I ended up just putting my laptop on my lap instead. In terms of watching in-flight entertainment, I didn’t find the offset screen to be bothersome. Despite sitting in a two-seat row, I found the 17.5-inch seat width to be pretty tight. My seatmate and I were both average size (for Americans), but we found that our shoulders and elbows touched frequently throughout the flight — especially when I was trying to type on my laptop. The 31-inch seat pitch didn’t leave much legroom! The 31-inch seat pitch left just three inches between my knees and the seat in front of me with both seats upright. Luckily, this space didn’t decrease substantially when the seat in front of me reclined, however, it became impossible to type on my 12-inch laptop once that happened. In terms of legroom, only aisle seats have entertainment boxes that limit legroom. 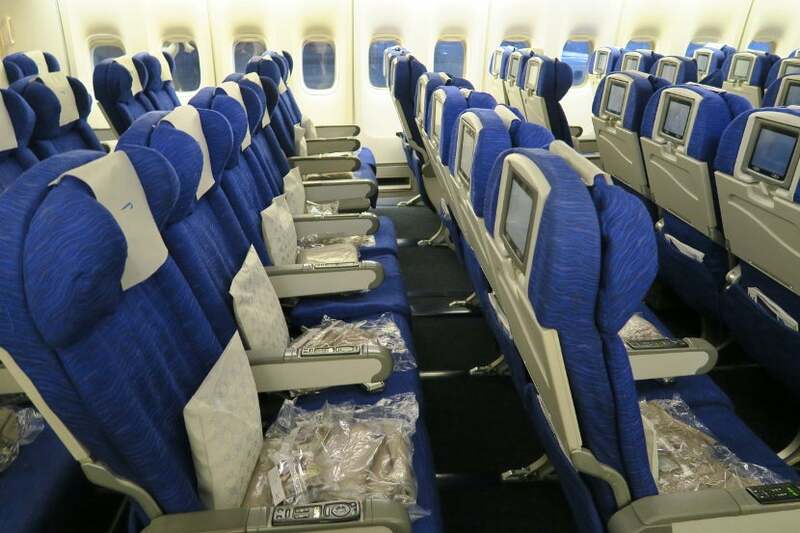 The seats featured sliding cushions for keeping your head upright while sleeping. The plane itself was certainly showing its age. My seat cushion felt like it was missing a back portion and the seat itself wasn’t well padded. 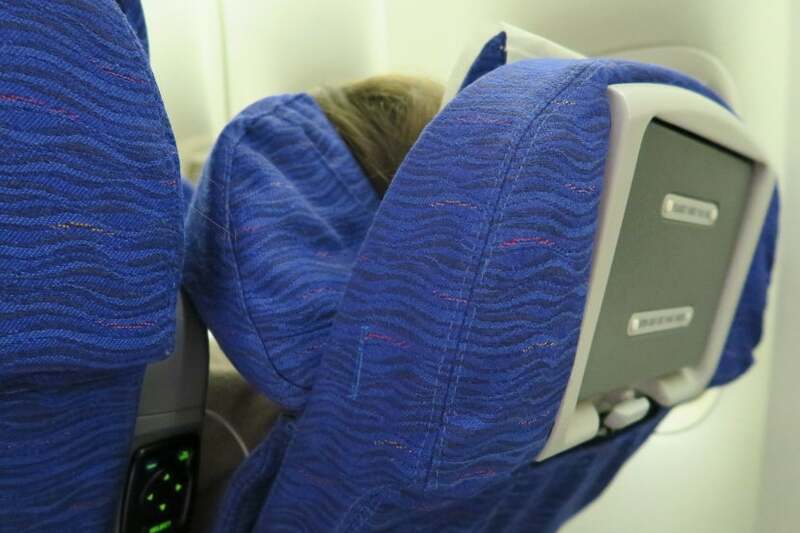 Additionally, the headrests had sliding wedges, as opposed to the more common adjustable wings, to help keep your head upright while you’re sleeping. I was also disappointed that there were no power outlets or USB chargers in the World Traveller economy cabin. Potable water taps were available by the rear bathrooms. Would you trust the water? The back of the plane featured four bathrooms, the crew rest area and two potable water taps. I did not try the water, but I like the idea of having a self-serve water source to fill a water bottle mid-flight. This area in the back of the plane also proved to be a nice place to stretch and stand. The galley between the two World Traveller cabins was also large and a decent place to stretch, but the flight attendants sat here overnight so it was easy to feel in the way. Half of the window shades remained up overnight in the rear World Traveller cabin, allowing sun to stream into the cabin well before breakfast was served. The cabin was dimmed after dinner (about 2.5 hours after departure). Although the forward World Traveller cabin passengers closed their window blinds before sleeping, my rear cabin did not. Hence, I awoke with a start when I realized it was light outside about three hours before landing. I assume not encouraging the rear cabin to close their window blinds before sleeping was an oversight by the flight attendants. 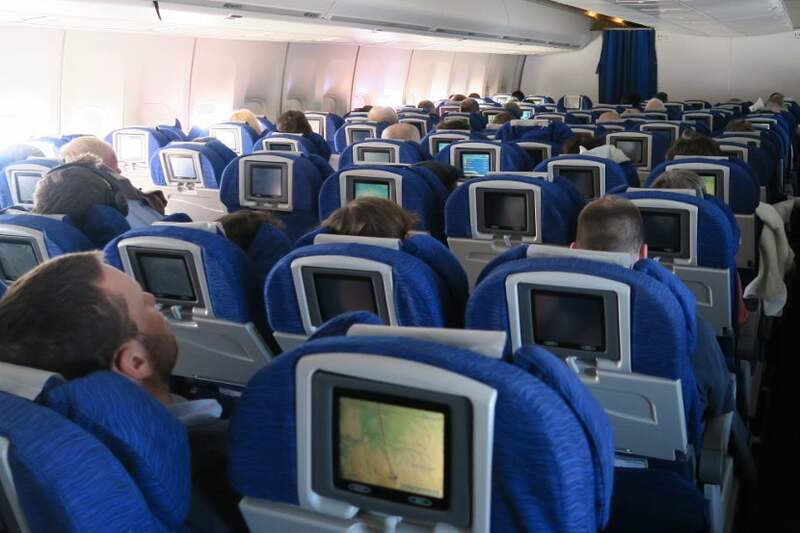 This 747-400 featured older seatback entertainment systems, which contained a surprisingly large amount of material. 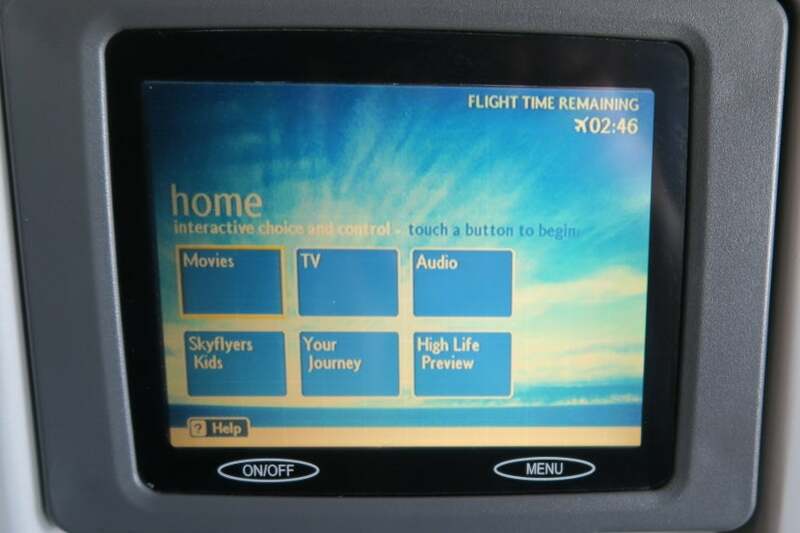 The seatback in-flight entertainment screens were small and not very high definition. Despite this, they did tilt and the selection of movies and television shows was sufficient. The map application showing the flight path had relatively few map details, but it was still an enjoyable way to track the flight’s progress. The audio selection was rather limited and it was frustrating that any audio would stop once another application (such as map view) was opened. The handset for the entertainment system, which also contained buttons for the overhead light and flight attendant call button, was in the armrest — my seat-mate kept accidentally turning off his light because of the light button’s awkward placement. The headphone jack was also in the side of the armrest. 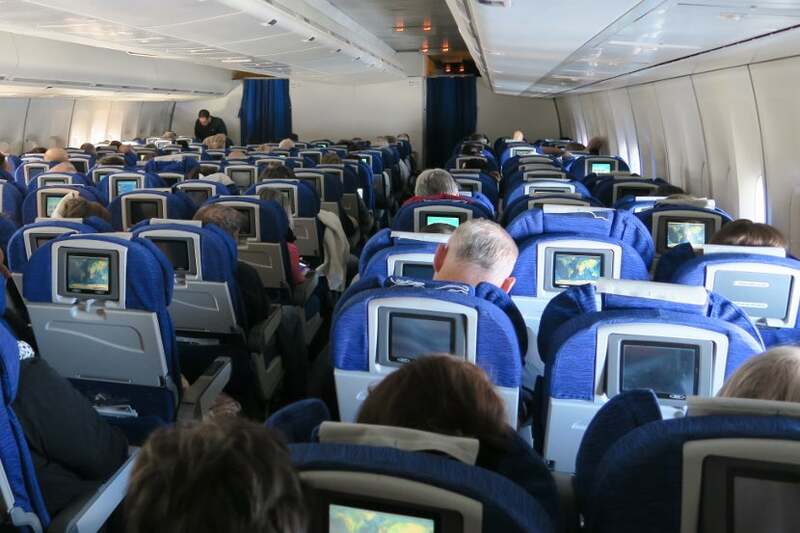 Two flight attendants served the entire rear cabin. The World Traveller economy class crew seemed friendly but understaffed. Although the rear World Traveller cabin seats up to 145 passengers, I only saw two flight attendants working in this cabin. 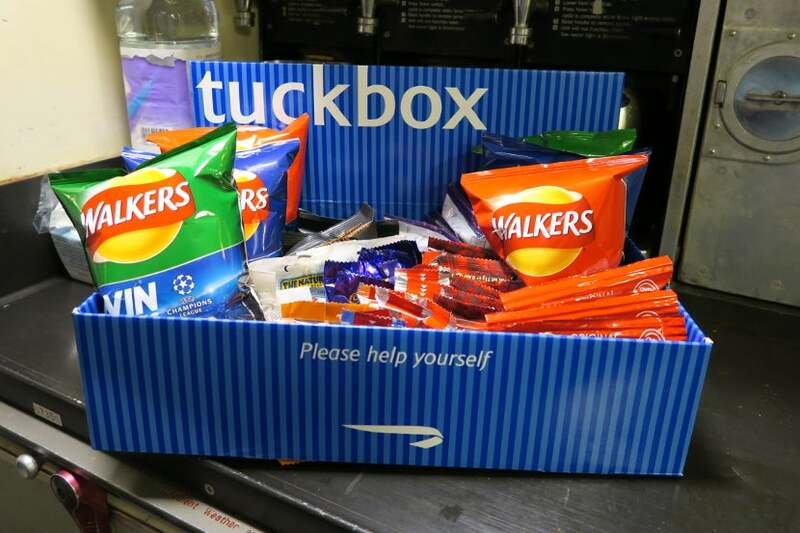 The self-serve snack box in the galley contained a large variety of snack items. 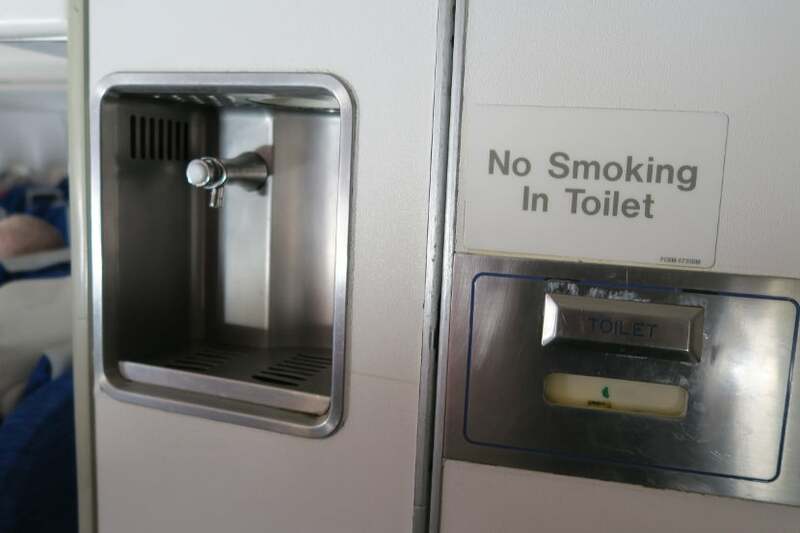 The crew had set up a self-serve drink and snack area in the galley between the two World Traveller cabins. There was a tray with various drinks, as well as a box of snacks that included chips, nuts, candy, cookies, crackers and gummy shapes. Although the curtains were kept drawn to this galley and the existence of snacks and drinks there was never announced, both times I visited, the flight attendants sitting in the galley greeted me pleasantly and asked if I wanted any additional drinks. The crew members I interacted with during the flight were generally friendly and polite. When I was stretching in the galley, I noticed they responded quickly to all call button requests. I was also impressed with how clean and restocked the bathrooms remained throughout the flight. Drinks and a small bag of sour cream and chive pretzels were served about 30 minutes after takeoff. Dinner service began about 50 minutes later and included a choice of chicken and mushroom casserole or penne pasta with sauce. Service started from the back of the cabin, so my row was one of the first to receive our meals. 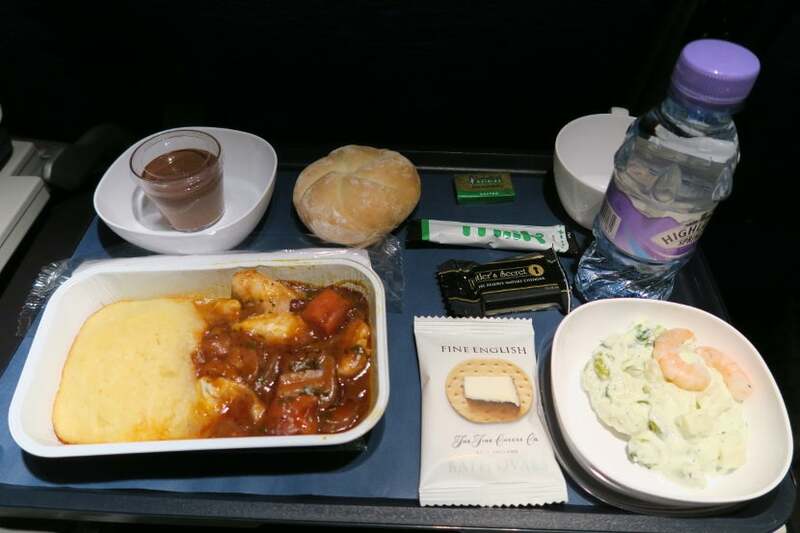 This World Traveller dinner didn’t look too appetizing. Luckily, some of it surprised me. Dinner started with a potato salad and two fresh-tasting shrimp, but the potato salad had no flavor. The crackers that came with the cheddar cheese were very dense. Cold bread was served with butter that was so hard I snapped my plastic knife in half attempting to spread it. The chicken casserole entrée consisted of potatoes that looked like cornbread with chicken and mushrooms in sauce. The dish looked entirely unappealing when I originally uncovered it. Despite its looks, the chicken was good white meat and the sauce was actually tasty and tangy. A British Airways London-departure constant, the chocolate and caramel pudding cup was served as dessert on this flight and was as savory as always. 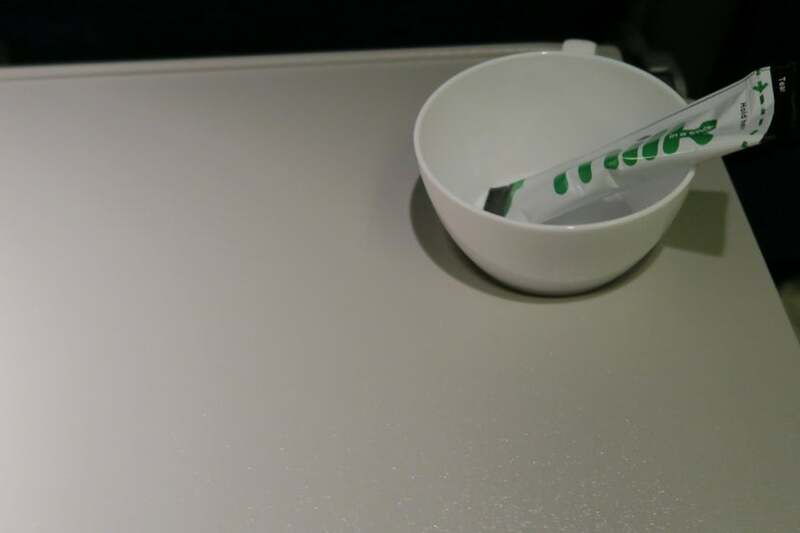 Sadly, my cup remained empty as no tea or coffee was offered on this flight after dinner. Perhaps due to understaffing, dinner service was very slow and our dinner trays weren’t removed until just more than 90 minutes after meals were served. On every British Airways long-haul flight I’ve taken, tea or coffee was served after dinner — but on this flight, no drinks (tea, coffee or otherwise) were served with dinner or shortly after. A flight attendant finally came through the cabin an hour after dinner trays were removed with another tray filled with cups of apple juice. Breakfast was surprisingly tasty and filling! 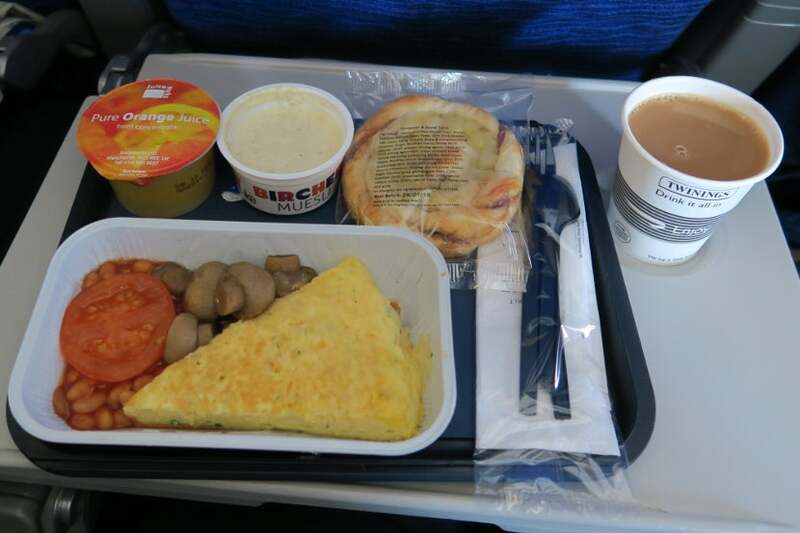 Breakfast was served 80 minutes before landing. Like dinner, breakfast was also served from the back of the cabin. There were two choices: traditional English breakfast or a Spanish omelet. I opted for the Spanish omelet since I didn’t want my first “traditional English breakfast” to be on the plane. The omelet came with mushrooms, a half tomato and beans. The mushrooms were tender but not overcooked, the half tomato was awkwardly big to eat without cutting and the pinto beans were good but had no seasoning. The omelet was actually a slice of powdered eggs with spinach and some spices mixed in, but tasted much better than it looked. My seat-mate ordered the traditional English breakfast and it looked very similar to the omelet except it had no beans, fewer eggs, a piece of sausage and a piece of bacon. Although the bacon smelled good, I’m glad I chose the omelet. Both meal selections came with concentrated orange juice, a tasty but not too sweet mango and passion fruit muesli and a cinnamon apple twist pastry. If I’d not been writing a review, I wouldn’t have even tried the pastry, but I did try it and was surprised by the fact that (1) it was tasty and (2) it was not overly sweet. Tea and coffee were served after breakfast, which was a treat as neither were served after dinner. Would I fly in this cabin on this route again? Although this flight did have its negatives — an older plane, a seemingly understaffed crew, tight seats and no power outlets — there were also some positives. The food provided was generally good and the snacks and drinks in the galley between meals were varied and plentiful. The crew was friendly. There was plenty of room to stretch and stand in the galley and at the rear of the plane. As for seat choice, I enjoyed sitting in a two-seat row window seat near the rear of the plane because of the extra floor space between the window seat and the window. For couples traveling together, reserving one of these seat pairs would be particularly valuable. Hence, if I needed to fly this route again, I’d certainly consider other options and try to get booked on a newer aircraft. However, if a newer aircraft was unavailable or substantially more expensive, I’d be happy to try the British Airways 747-400 again. 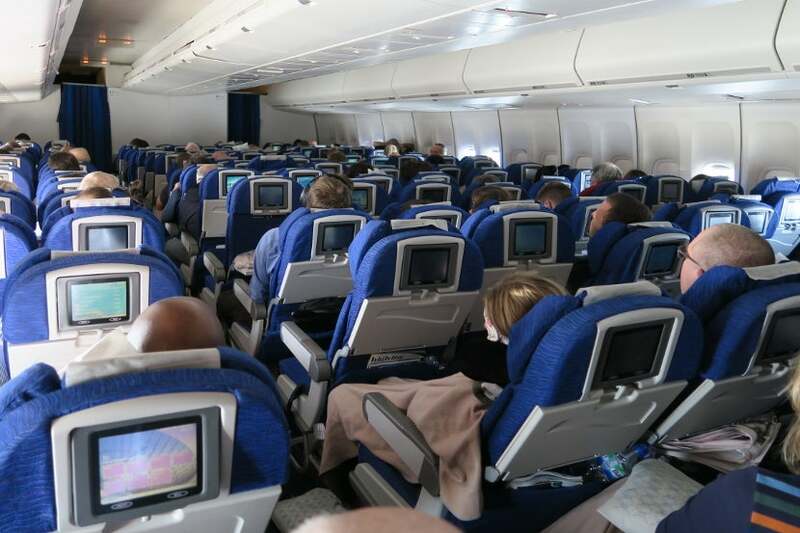 Have you flown in World Traveller economy on a British Airways 747-400 recently? What was your experience like?